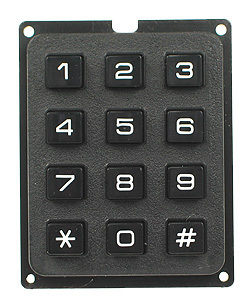 This keypad has 7 pins on the back, with 0.1-inch spacing. Can plug directly into a solderless breadboard or be used with a ribbon cable (e.g. our RC14FF12) or a modular breakout cable (e.g. 7-pos. housing and 7 modular wires).